Saint Gianna Beretta Molla is a modern day saint who lived a life of heroic virtue. She was a physician, a working mom, and loving wife. Gianna was born in Italy on October 4, 1922. She was brought up in a large Catholic family. Through the Catholic education she received from her parents, who were Third Order Franciscans, Gianna grew to have a deep respect and love for life. She considered life to be a beautiful gift from God. In 1942, Gianna began studying medicine in Milan while also serving the poor and elderly through Catholic Action and the St. Vincent de Paul Society. After graduating from the University of Pavia in 1949 with degrees in medicine and surgery, Gianna opened a medical office in Mesero, near her hometown. She was attracted to helping mothers, babies, the elderly, and the poor, which inspired her to specialize in Pediatrics at the University of Milan. Gianna always considered medicine to be her mission in life, and marriage to be her vocation. She had hoped to travel to Brazil and offer her expertise in gynecology to poor women but was unable to due to her chronic ill health. Gianna and Pietro had three children: Pierluigi, Zita, and Laura. Gianna loved being a mother and handled everything with love and grace. In 1961, Gianna became pregnant with her fourth child. Near the end of her second month of pregnancy, the doctors discovered that she had a fibroma in her uterus. This meant she was carrying both a baby and a tumor. She was given three choices. The first choice was to have an abortion, which would save her life and let her continue to have children but would take the life of her baby. The second, a complete hysterectomy, would also save her life but she would again lose the life of her baby and would not be able to have any more children. The third choice, removal of only the fibroma, could potentially cause further complications but could save her baby’s life. Gianna made a heroic choice to only remove the fibroma to preserve her child’s life. She was willing to give her life for the life of her baby and told her surgeons to save the child’s life over her own. Throughout all of this, Gianna and Pietro prayed constantly and sought comfort in the Faith. On April 21, 1962, Gianna Emanuela was born. The doctors tried everything but a week after the baby was born, Gianna passed away. She is buried in Mesero, Italy. Inspired by St. Gianna, the first pro-life Catholic healthcare center for women in New York was built. It is called the Gianna Center, and it provides care with specialized gynecologic care. Saint Gianna’s Maternity Home in Warsaw in North Dakota was also influenced by St. Gianna. 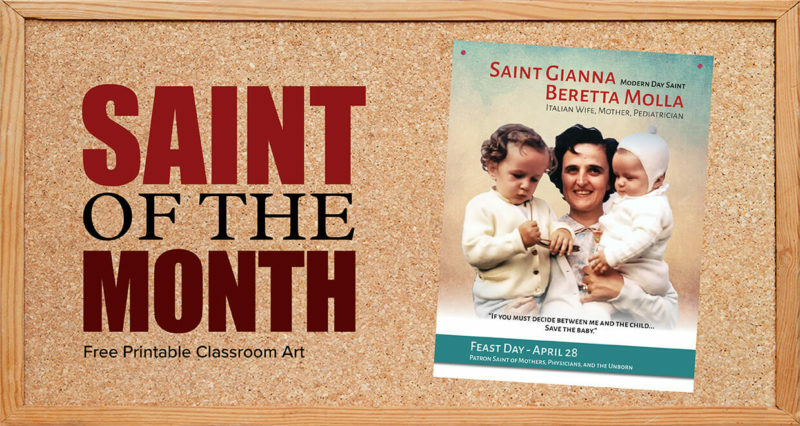 St. Gianna Beretta Molla is the patron saint of mothers, physicians, and the unborn. Her feast day is on April 28th. St. Gianna Beretta Molla, pray for us. the grace to rest securely through the time and eternity in Your loving divine arms. Amen. Download the free printable monthly saint page using the button below. You can pin it to your classroom wall or place it on your refrigerator to help your children learn more about Saint Gianna Beretta Molla.